Infrared heating offers a variety of important benefits that strongly recommend it for use in a wide variety of commercial and industrial applications. Because infrared radiant heat travels directly from the heat source to the object heated, without any need to first heat the intervening air, it is faster and more effective in warehouses, auto garages, along factory assembly lines, in aircraft hangars, and elsewhere where large openings or frequent opening/closing of doors brings in outside air. Forced air heaters would have to constantly heat newly introduced cold air, but not so with infrared heaters. Also, infrared first heats the floor and other low-lying objects, which retain their heat and re-radiate it into the air, heating the room from the ground up. Studies have also shown that infrared heating is more energy efficient, as safe as the heat from the sun (which operates on the same principle), and more environmentally friendly since they are typically fired by natural gas, the least ecologically harmful of all fossil fuels. DRP has been building efficient, effective, and environmentally conscious heating systems for use in extreme outdoor and indoor environments for over 60 years and has become one of the most respected names in the industry. 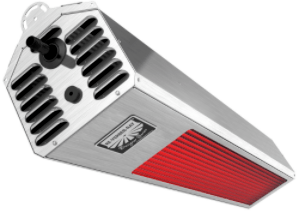 They manufacture a variety of high intensity gas-fired heaters that safely and quickly deliver large quantities of heat at maximum efficiency levels. 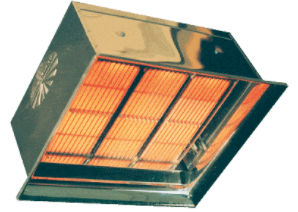 ATI can assist you in procuring the high-intensity gas-fired infrared heater that best fits your needs.